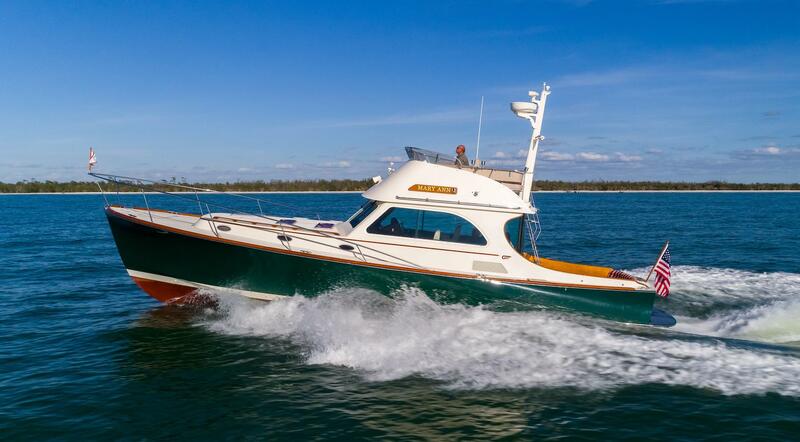 Denison Yachting announces the sale of a 44′ Hinckley Talaria 2007 located in Naples, Fla. Denison’s Don Strong represented the Seller while Michael Beers of McMichael Yacht Brokers represented the Buyer. MARY ANN features beautifully maintained varnish work, low hours (less than 800) on her twin Yanmar diesels + a shallow draft (max 2′ 4”). She has a teak sole in the cockpit as well as forward facing seats and a ladder leading to the flybridge. Electronics include an ICON VHF, Raymarine Chartplotters (both in the interior and on the bridge) and Raymarine auto pilot. Additional options include a double Stidd helm chair on the bridge, a storage locker on her aft dinette bulkhead, a pilothouse table with Holly inlay around the edge, an Algae-X fuel system on both engines as well as joystick control for easy docking.